So we see that the most terrible threatenings ever found in the word of God are pronounced against those who worship the beast and receive his mark. On the other hand, in Revelation chapter thirteen in the last few verses, we are told that those who refuse to worship the beast, those who refuse to receive his mark, will not be permitted to buy or sell, will be ostracized — cut off from society — and eventually will be placed under sentence of death. So we see that those who would serve God will find themselves in a great dilemma. They will be commanded by the powers of the earth to receive this mark of the beast, and if they will not do this it will be decreed that they cannot live in the world. However, the God who is above all, who is our Creator, in whom we live and move and have our being, states that those who worship the beast shall receive the most terrible punishment. Today there are millions of Christians in the world, millions of people who go by the name of Christ, but are they all true Christians? No. Many false professors fill the churches. So, in Revelation chapter three and verse ten, the Lord speaks about an hour of temptation that is coming, which shall “try” those who dwell upon the earth. This hour of temptation will arrive when the mark of the beast is forced upon every person on earth. This great test of the mark of the beast will separate the true Christian from the false pretender. When we come to the place where we see our homes, our cars, our furniture, our jobs, our friends, everything which we have labored so hard for, everything on which our hearts have been set all our lives in danger of being lost, it will require a terrible struggle to give up all these things in order to follow the Lord. Then it will be clearly revealed who the people are who truly love the Lord with all their hearts, and who those are that only bear the name of Christ, but in reality love themselves and the things of the world best of all. As we proceed with this study, the whole issue will become much clearer. Please ask God for the guidance of His Holy Spirit as you carefully read this article. I am sure that when you come to the end of it you will be better prepared to face this awful crisis which is soon to come upon the earth. God bless you as you read. In the book of Revelation, in chapter 13, God tells us about two great beasts which would arise. The first, one coming up out of the sea, had the body of a leopard, the feet of a bear the mouth of a lion, and had seven heads and ten horns. The other, coming up out of the earth, had two horns like a lamb, but spoke like a dragon. God gives us some identifying marks which help us to clearly, unmistakably, identify these two beasts and to understand the kind of work which each one will do. Now when we read about these two beasts the first question that comes to mind is, “Are these real beasts, are we to expect that such monsters will one day walk abroad on the earth?” This is not such a foolish question for I have heard people express this opinion. So what is the answer to the question? Are these real animals, or are they symbols representing something else? The Bible interprets itself, and when we turn back to the book of Daniel, which is very similar to Revelation being also a book full of beasts and other symbols, we find in chapter 7 and verses 17 and 23 that God gives us the interpretation of the symbol of a beast and tells us what this symbol means. Verse 17 says, “And these great beasts which are four, are four kings which shall arise out of the earth.” So we see that a beast represents a king. But in verse 23 it says: “And the fourth beast shall be the fourth kingdom upon the earth…” So it is clear that a beast is not meant to represent just a king, but the kingdom itself. Therefore we can begin with the understanding that when we see a beast, we are to understand that God is talking to us about a KINGDOM. In Revelation it is plain that we are dealing with two kingdoms. Two great kingdoms which Satan would use in the end of time to make war against God’s people. When we take a careful look at the identifying marks of these two beasts, it is fairly easy for an open-minded person to identify the kingdoms or powers which they represent. As you read down to about verse eight, it tells you several facts about the first beast. Among other things it tells you that he has on his heads the name of blasphemy, that he opens his mouth and speaks blasphemous words against God, that he makes war against the people of God and tries to destroy them and that Satan gives him his power, and his seat, and great authority. It goes on to say that all the world wonders after this beast, and admires him. The strongest clues to the identity of the Beast are to be found in the book of Daniel in chapter 7. 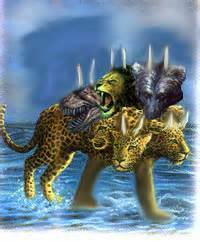 In this chapter we see four great beasts rising up from the sea: a lion, a bear, a leopard, and a terrible beast with ten horns on its head. We are told that these beasts represent four great kingdoms which would arise out of the earth (Daniel 7:23), and it is not difficult to recognize that these kingdoms are Babylon, Medo-Persia, Greece and Rome. The book of Daniel was written about two thousand, six hundred years ago. Since that time there have been four great kingdoms which ruled over the earth. There have been only four; no more. In fact, God tells us that there will never be a fifth one. The next time that one single kingdom rules over the whole earth will be when God sets up His everlasting kingdom which shall never be destroyed (Daniel 2:37-44). Therefore, it is not difficult to identify the kingdoms which these beasts represent. History tells us plainly that the four great kingdoms which have ruled over the earth during the past three thousand years are Babylon, Medo-Persia, Greece and, last and strongest of all, Rome. As Daniel looked at these beasts in his vision he noticed that the fourth beast, the one representing Rome, had ten horns on its head. What was the significance of these ten horns? History tells us that as time passed even the great kingdom of Rome began to lose its power. As it weakened, it was gradually broken up into ten smaller kingdoms. These ten kingdoms were originally known as: the Heruli, the Vandals, the Ostrogoths, the Burgundians, the Visigoths, the Anglo-Saxons, the Franks, the Alamanni, the Suevi and the Lombards. However, today these ten kingdoms exist as the modern nations of Europe. The Anglo-Saxons became the English, the Franks became the French, the Alamanni became the Germans, and we can still identify most of the others. (B) Make war against the saints and prevail against them. (C) Afflict God’s people for three and a half times, or years. Do you see? The beast does exactly the same things as the horn! (A) He speaks great things and blasphemies. (B) He makes war with the saints and overcomes them. (C) He continued for forty-two months (which is the same as three and a half years). Now let me ask you a question. Do you believe that there were to be two such powers on the earth; Do you believe that two antichrist powers would arise which would do exactly the same works, and continue for exactly the same period of time? I am sure this is not what God is telling us. It is plain that both passages are speaking of the same one power only using different symbols. So we can settle it then, that the little horn of Daniel chapter 7 represents the exact same power as the first beast of Revelation chapter 13. The question then is: who is this little horn? If we can identify the horn, then we can know who the beast is. Let us notice that it arose among the ten horns. It came up among the nations of Europe AFTER the Roman empire had been broken up. So we are looking for a power which arose in Europe after the time of pagan Rome. We are looking for a power which was different from the other kingdoms, which was more powerful than the other kingdoms, for it says in Daniel7:20 that it plucked up three of the other horns. That is, it destroyed three kingdoms. We are also told that it was more “stout” than the others. There is one power, and one power only, which fits the description. This power is the Papacy. It was the Papacy which emerged as the most powerful institution in Europe after the decline of the Roman empire. It was the Papacy which was responsible for the destruction of three nations which opposed the teachings of the Roman Catholic Church as it was beginning to rise to power. We will deal with these facts in greater detail as we continue with this study and you will see that every single detail of the prophecy has been fulfilled by the Papacy. “The Papacy?” You ask, “What on earth is the Papacy?” The Papacy is the institution which is ruled over by the pope. It is partly a church and partly a political power. It is a combination of the state of the Vatican and the Roman Catholic Church. The Vatican, though a small state, is an independent political country, while the Roman Catholic Church is by far the largest of all the denominations within the bounds of Christendom. Both of these institutions are bound together by one common tie: They both look upon the pope as the head. The Papacy is an institution where church and state are truly united in one. I am going to show more proof that the Papacy is the power represented by the beast, and I believe you will be satisfied with the evidence that is given. There is a great deal of proof. We will take the points and deal with them one by one and you will find that what is written in Revelation chapter 13, from verse one to eight, is a perfect description of the Papacy. Let us take a quick look at how the Papacy came into existence. This powerful power came about as a result of a gradual union between Christianity and paganism which took place over a period of many years. Just a couple of centuries after Jesus returned to heaven the church which He left behind began to introduce pagan principles into its worship. Little by little it degenerated until it came to the place where it was no more than a pagan institution barely disguised as a Christian church, with all the strange forms of worship which are today present in the Roman Catholic Church. So what we find here friends is that even from the days of the apostle Paul the mystery of iniquity was already beginning its work, and Paul stated that it would continue to develop in the church until the conditions would be right for the man of sin to appear in the Christian church. He would sit in the temple of God, claiming to have God’s authority and power, and to be deserving of the praise and worship due to God Himself. This prophecy was fulfilled exactly as Paul said it would be, and not very long after the time of Paul either! You see, men came into the Christian church who were more interested in popularity and in worldly recognition than in faithfully serving the Lord Jesus. Just like in so many churches today, people wanted what was acceptable to the society in general. They did not want true Christianity. As Christianity became more widespread it gradually gained acceptance and persecution by the pagans ceased. This opened the way for persons to join the church who were more interested in the prestige and influence which an office in the church could give, than in the earnest and true Christian lifestyle which had been called for in the days when the church had been the object of scorn and reproach. These worldly- wise leaders decided that it would be a good plan to break down some of the barriers which existed between the teachings of Christianity and paganism in order that the Christian faith might be more easily accepted by the pagans. It seemed to them to be a good plan for winning pagans to the faith. It was during this time that celebrations such as Easter and Christmas were introduced into the Christian calendar, adopted from pagan festivals and given different meanings. There were many other similar marriages made between Christianity and paganism during that period of time. That was the beginning of the Roman Catholic Church. Of course there were, from time to time, sincere and true Christians who spoke out against the compromises which were slowly but surely corrupting the pure apostolic faith and changing the Christian church into a thoroughly pagan institution. But with the decline of the true Christian faith, there came into the church the persecuting spirit of Satan, and the church of Rome found a way to deal with those who opposed her. From that time she began a wave of persecution that lasted for more than one thousand years and which cost the lives of many millions of Christians who dared to stand up and call for a return to the true religion of the Bible. Some historians estimate that during that period, from the year 538 A.D. until about 1750, more than sixty million Christians were put to death on the authority of the Roman Catholic Church because they dared to believe and to teach the simple and pure religion of the Bible. Many were burned alive at the stake. They were tortured to death, they died by the sword and by every conceivable means of destruction which Satanic ingenuity could devise. For what crime? For the crime of daring to believe and to preach the true religion of Jesus Christ. This is what the Bible referred to in Revelation 13:7, where it says that this beast made war against the saints. The Bible also says that all the world would wonder after the Beast. For many hundreds of years, the Roman Catholic church was one of the most powerful and feared institutions on the face of the earth. You see, in those days the great religion on the earth which reached into most of the countries of the earth, was Roman Catholicism. People were taught to believe that the pope was God’s representative, that the power of salvation, the power of life and death now and eternally, was in the hands of the priests of Rome. It was taught that the common people could not understand the Bible and the people were forbidden, at times on pain of death, to read the Bible. Many were punished with a most cruel death for the dreadful crime of daring to have the Bible in their possession. The only idea which the people had of Christianity was the corrupted worship which was passed on to them by the church of Rome. And so they were taught that the pope had the power to send men to either heaven or to hell and that the priests, as his representatives, had similar power. Understandably, people were very afraid to displease the pope and every head of state, every king, in every country, feared him. People generally believed that the authority of the pope was more to be recognized, more to be obeyed, than the authority of any king. If the pope should excommunicate an individual, or place a country under an interdict, this would mean that he had banned that person, or that country, from the favor of God. It was taught that such a person or country was damned, bound for hell, and that there was no way in heaven or earth for them to be saved. People feared to incur the displeasure of the pope, and kings were very anxious to please the pope in all matters. “…millions of human beings across the centuries have looked upon the Pope with an awe that for all practical purposes has elevated him to a position of deity. “With such influence in his hands, the Pope is a world leader whom kings and presidents regard with profound respect. Only a handful of kings have resisted the Pope and kept their thrones. For the most part, they have feared the Pope and obeyed him. In Germany Emperor Frederick lay down on the floor and allowed Pope Alexander to stand on his neck. On another occasion, Pope Celestine III crowned Henry VI of England with the usual colorful ceremonies. As the English king knelt in front of him, after having had the crown of the British Empire placed upon his head, the Pope reached forward with his foot and kicked the crown from the monarch’s brow. At another time, Pope Alexander rode horseback down the streets of Rome. Walking along on either side of his horse, and leading the animal by the bridle, went Louis, King of France, and Henry, King of England. You will notice that today the Papacy is regaining some of that power and influence, but it has not attained to the same pinnacle on which it stood in the past. Here, surely, are examples of the most heaven-daring blasphemy ever uttered by a power which professes to be a Christian institution, and these are just samples of many such statements which have been made by the Papacy. One other piece of evidence which we must also examine in greater detail is the matter of the time periods which God gives us in connection with the little horn and the beast. Daniel tells us that this period was three and a half times (or years), while John tells us that it was forty-two months, which also works out to three and a half years. Let us establish something here: Today we calculate a year as having 365 days, and the number of days in a month varies from 28 to 31. However, in the biblical calendar, which the Jews used, every year had exactly 360 days and every month had 30 days. Let us bear this in mind. History tells us that the period of the Papacy’s greatest power lasted for a period of 1260 years. 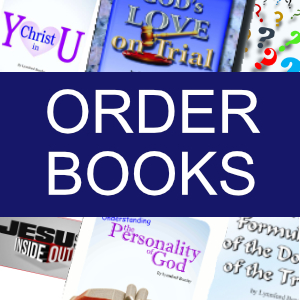 We have already mentioned that in these prophetic books a day is used to represent a year. (If you look at Ezekiel 4:6 and Numbers 14:34, you will see where twice before God applied this same principle and used a day to represent a year). Now the Bible says that the little horn would persecute the saints for three and a half times. How many days would that be? If each year had 360 days, then three and a half years would be three hundred and sixty multiplied by three and a half, which would work out to exactly 1260 days! Again we are told that the beast would continue his persecuting work for 42 months, and 42 months, with 30 days each, works out to be the same 1260 days. Since a day is used to represent a year, what we have here is a time period of 1260 years. The exact time for which history says the Papacy continued as a dominant world power. Hundreds of years ago, as the Papacy was becoming more and more influential and on the way to being the most powerful political force in the world, a stumbling block arose in her way. Three of them in fact. The nations of the Heruli, the Vandals and the Ostrogoths were not favorable to all the teachings of the Papacy. In fact they were strongly opposed to certain points of papal doctrine. Especially the doctrine of the Trinity. The problem was that the Heruli were at that time in control of the city of Rome which was the headquarters of the Papacy. These three powerful kingdoms opposed the Catholic Church and used their influence to suppress its teachings. As long as these nations existed they effectively cut off any hope of the Papacy ever rising to any position of greater influence and power. It was only when the other Catholic nations of Europe made war upon and destroyed these three kingdoms, that the way was opened for the Papacy to rise to the pinnacle of worldly power. The last of these three kingdoms, the Ostrogoths, was destroyed in the year 538 A.D. and from that time the Papacy rapidly rose to a position where she dominated all the kingdoms of earth for a period of 1260 years. It was many centuries later, when the reigning Pope Pius VI, was taken prisoner by the armies of Napoleon in the year 1798, that the long reign of persecution of the Papacy came to an end. This period lasted from 538 when the third kingdom was destroyed to 1798 when the Pope was taken prisoner, a period of 1260 years. Again we see that the description of the beast is exactly matched by the Papacy. The other beast which is found in the 11th verse of this same chapter 13 came up out of the earth. Now if waters represent multitudes of people, then clearly the earth represents the opposite, for earth is the opposite of water. So then the earth must represent an area of the world in which there are relatively few people. It says that this second beast had two horns like a lamb. Remember that Jesus is the Lamb in the book of Revelation. But this beast spoke like a dragon. Remember that Satan is the dragon in the book of Revelation. You can read all of this for yourself, simply take up your Bible and turn to Revelation chapter 13. It is all there. Do not take my word for it, but check it out for yourself. Make sure that what you believe is based on what you read in the Bible. It says that this second beast — the one which arises from the earth and has two horns like a lamb but speaks like a dragon — begins to do many marvelous things. In fact he performs miracles, even calling down fire from heaven on the earth. These miracles are similar to some of the greatest miracles performed by God’s servants during Bible times. It says furthermore that he commands the people who dwell on the earth to make an image of the first beast — that is, the one who came up out of the water — and that they should give life to that image of the beast. Then this second beast commands everybody to receive a certain mark in the forehead or in the right hand, and that no man might be able to buy or sell except he has the mark, or the name, or the number of the beast. And more than that, he goes on to command that anybody who does not receive this “mark of the beast” should be killed! The Bible finishes by saying that the number of the beast is six hundred and sixty-six. What great power exists on the earth today which seems to have the characteristics of a lamb? That is, it seems to embrace the principles of Jesus Christ, the Lamb of God? It seems to present the appearance of a Christian power; and yet the Bible says that it speaks like a dragon. Underneath it is working with Satanic principles, but on the surface it seems to be a Christian country. Which great nation, a nation with influence all over the earth, will influence the whole world to worship the first beast? Which nation has that kind of power and influence, which looks like a “Christian” nation? In fact, this country appears to be such a good Christian country with such freedom such godly principles that when people go there they don’t even want to return to their own country Which country is that? I am sure that you have already concluded that this must be the United States of America. This is the power which is represented by the second beast. A great political power which is able to persuade the whole world to give in to its demands. If this is true, then what God is trying to tell us is that the United States of America will one day influence the whole world to “worship” the Papacy, or the Roman Catholic institution. Today, among the religious bodies of the United States of America , there is a growing emphasis on miracles. The charismatic movement is sweeping through all the churches and many people are seeing this as the mighty moving of the Holy Spirit. But we need to be very careful of what we believe and what we get involved in, for it is through these religious bodies in the United States of America that the mighty miracles will be performed which will deceive the whole world. The Bible prophesies that these religious powers will perform miracles as a means of convincing the people that they should make an image of the first beast. What this means is that in the United States of America a system will be set up which will be exactly like the Papacy. That is what the image of the Beast is — a system which is just like the beast! What are the main features of this first beast, the Papacy? If we can identify these main features, then we know that when we see these same features duplicated in the United States, then America will have formed an image of the beast. Now basically, the Papacy is a religio-political system. This means that it is partly a church and partly a political state. Both secular and religious authority are combined in one. It is not so yet in the United States. At the moment, there is still a very strong separation between church and state and the Constitution of the United States of America even has a clause in it which guarantees this separation. However, there are powerful people in the United States who even at this moment are using all their influence to break down this separating wall between church and state, and the prophecy tells us that they will succeed. At the moment, the separation remains, but, the mighty miracles which will be performed by these religious forces will be the ultimate persuasion. This will be seen as the hand of God at work and it will be seen as the will of God that the church should have an input in deciding the policies which run the country. In other words, that there should be a union between church and state. When this happens in the United States, then we may know that America has formed an image of the Beast. Inevitably, just as in the case of the Papacy, this image of the beast will become a persecuting power seeking to destroy all those who are not in harmony with its decrees; all who will not worship in the way that it demands. If you are in touch with what is happening today by listening to the news or reading the newspapers, then you already know that there are strong movements afoot to bring about this religio-political union. There is a great cry among the churches today that they ought to have, and that they will have, a bigger input in the governing of the various countries and in the way that the world is run. Today, the World Council of Churches has become a very influential institution with the power to influence many of the policies which govern the world. According to the prophecy, the unholy marriage between these two powers church and state will soon be a reality in the United States. The image of the beast will be fully formed. What a time of testing that will be for God’s people! Who will then dare to stand up and say that God ought to be obeyed rather than men? To take such a stand at that time will mean placing one’s life in the greatest danger, but all who are faithful to the Lord, all who are truly His children, will remain faithful to Him. All the powers of earth and hell combined cannot cause them to be disloyal to their Saviour. Now that we have settled the question of who these two beasts are, the next question which we need to face is, “What is the mark of this beast?” Remember, please, that the mark is the mark of the first beast. There are some fundamental things which we need to understand before we can begin to deal with this topic, and one of these is the truth that ever since God created man and placed him on this planet the great issue has been loyalty to God the question of whether a person would obey God, or obey some other master. From the Garden of Eden when God said to man, “thou shalt not eat of the fruit of the tree…” and Satan persuaded him that he should eat, this has been the issue. If you read the Bible carefully, you will see that this has always been the separating line between God’s people and those who are not. Obedience! That was the critical issue, and that is what reveals whether we are God’s people or not. Yes, it is true that we only obey as Jesus is allowed to control our lives. We of ourselves can do nothing. Nevertheless, when Christ lives in us He will lead us to obey God, and this is how we may identify the person who is a true and sincere Christian. We may know him by his fruit — by his obedience. (Matthew 7:20) In dealing with this question of the mark of the beast, we need to bear this fact in mind. Let me ask you a question; a simple question: Will God punish people for anything else apart from sin? Will God be displeased with men for anything other than sin? The obvious answer is no! The only thing which will bring God’s punishment down on men is the fact that men commit sin. Sin is what causes separation between man and God and makes man deserving of death. God says, “The soul that sinneth, it shall die.” The next question is this, “What is sin?” The Bible gives us a clear answer in 1 John 3:4. It says, “Whosoever committeth sin transgresseth also the law, for sin is the transgression of the law.” So then a man commits sin when he breaks or transgresses the law. Consider then: Is it a sin to receive the mark of the beast? Is the mark of the beast sin? Is the receiving of this mark something which God will punish? In Revelation 13 verses 9-12 God promises that those who receive the mark of the beast will receive the most dreadful punishment ever meted out to any human being, so we may be certain that sin is involved in receiving the mark of the beast. Since sin is the transgression of the law, it must mean that receiving the mark of the beast will involve the breaking of the law of God. This has always been the basic issue from the beginning of time — the question of obedience to God’s law — and at the end of time it remains the key issue. Revelation is a book of symbols. Many people are expecting that some day people will be going around with some kind of device by which they will place some kind of literal mark on the bodies of people. Some specify that this will be the number 666, but remember that the NUMBER of the beast is 666, which helps us to identify the beast. The MARK of the beast is something else. Revelation is a symbolic book. Things are not the way they appear. When we see that people are to receive a mark, are we to believe that this is to be a literal mark? Some kind of tattoo which we can see with our physical eyes? Something which is to be engraved on people’s bodies? Why do we look at it in such a simplistic way? It is interesting to note that the book of Revelation speaks about two marks. One set of people will receive a mark which is called “the seal of God.” (Revelation 7:1-3) The rest of the world will receive a mark which is called, “The mark of the beast.” Now in order to help us to understand what these two marks are, I’m going to go right back to the very beginning. You see, this is not something new which crops up at the end of time. The controversy between God and Satan began before this world was created and has continued up until the present time. The principles involved, the issues at stake are basically the same from beginning to end. God does not change and Satan’s strategies have not changed very much either. The issues have come to us in a different context, but in the garden of Eden, the key question was that of obedience to the law of God, and Satan convinced Adam and Eve to disobey God. He made them believe that disobedience was a trivial thing, but with God, obedience is always a crucial test in determining our loyalty to Him, and this is still the issue here at the end of time. From the very beginning God has had a mark which He has specifically stated is a sign between Himself and His people, and God has placed that sign on everything which He has claimed as His. Of course, we need to understand that one of the devil’s key strategies is that whenever God establishes something which is of importance, Satan tries to set up a counterfeit, an alternative which looks similar, but is not quite the same. This he does in order to deceive people and to lead them into something which is contrary to the will of God; something which seems to be okay to the person who is not a careful student of God’s Word and who is not led by the Holy Spirit. So as we look at God’s mark, or God’s sign, let us keep this in mind. Let us go back to the very beginning. In Genesis chapter one we are told that God made this world in six days. Of course He took six days because He chose to, because a God of infinite power could have created it in one second. God chose to take six days for reasons which He knows best. However, since God took six days to create the world, then each week should have had just six days, because the week came into existence because of the time which God took to make the world. The creation week was the first week, and every other week since then has been patterned after that first week of this world’s history. So the week should have had six days! But in Genesis chapter 2:1-3, the Bible says that when He had finished His creation, God rested. God entered into an experience on the seventh day which the Bible describes as “rest.” In Exodus 31:17, we are told that God was “refreshed” by that experience. It was such a beautiful experience for Himself that God blessed that day. He sanctified it and He set it apart. To “sanctify” means to set apart for a holy purpose. To “bless” means to make holy. From that day God blessed the Sabbath and sanctified it BECAUSE He rested on that day. Notice that all this happened before there was any sin on this world. It was a part of God’s perfect plan. When God’s work of creation was completed He set a seal upon it by placing the seventh day at the end of the week as a perpetual reminder of the fact that He is the Creator and that He created the world in one awesome week as a reminder that He is the Almighty God; the One who does not require endless ages of evolution to create a perfect thing out of nothing. The seventh-day Sabbath stands therefore as a seal, as a mark, as a perpetual witness to the truth that this world was created in six days. So this day was added to the week, and this is why even today the week has exactly seven days. No more, no less. I want you to notice that the seventh day was added to the week for one purpose, and one only. That it came into existence as a part of the week as a memorial of God’s experience of rest. More than that, however, it was set apart for a holy purpose. The same holy purpose for which it was used on the very first Sabbath when God was refreshed. That holy purpose was that man and God should have uninterrupted communion together just as God had with Adam and Eve on that first day after they were created, that first Sabbath when the fellowship “refreshed” the Spirit of Jehovah. This is the only reason for which this day has been attached to the week. “I gave them my Sabbaths to be a sign between Me and them.” It was, and is, God’s Sabbath, but He gave it to the Jews. A sign between God and the Jews that they could know that He was the One who was their God, their Sanctifier; the One who made them holy, the One who had set them apart to be a peculiar people. Not that it was the Sabbath of the Jews. It was God’s Sabbath, given to the Jews because they had now become God’s people; they now entered into a special, peculiar relationship with God and this, the keeping of the Sabbath, was the sign of that relationship. Some people say that this relationship was only between God and the Jews but the Bible does not support this idea. In Isaiah chapter 56 God says that the stranger (and the word “stranger” there means “Gentile”) who joined himself to the Lord, and who would take hold of the Sabbath, would also receive a place and a name better than that of sons and daughters. So this privilege of sonship, of entering into a covenant relationship with God, was always available to the Gentiles. But as you will read here in Isaiah 56, it was dependent on the Gentiles also accepting the Sabbath, the sign of God’s covenant relationship. Friends, God never broke that covenant. God never changed that sign. Though many people try to tear down the law of God and to say that the Sabbath was abolished, the Bible does not teach that doctrine, and we have to look somewhere outside of the Bible to find authority for that belief. Later on in this message we will see exactly where this change came from and how it came about. Colossians 2:16, 17 says that the Sabbaths were a shadow of things to come, but if we think carefully we will see that this could not include the seventh-day Sabbath. The Jews had many Sabbaths which they observed, for the word “Sabbath” really means “rest.” (See Leviticus 23: 24, 32, 39; 25:4.) But the seventh-day Sabbath was peculiar because it was God’s Sabbath, intended to commemorate God’s rest. These other Sabbaths, like the Passover, the Day of Atonement, Pentecost, and many others, were shadows, or types which pointed forward to some great event in God’s plan of redemption. The seventh-day Sabbath was not one of these types. You see, these types were instituted after man sinned. They were to be lessons, or parables which were intended to teach the Jews about God’s plan to redeem man from sin. But the seventh-day Sabbath was from before man sinned. It was a part of God’s perfect plan. It was no afterthought. Not something put in as a result of sin, but there from the beginning a part of God’s perfect plan for sinless man. The true value of the Sabbath lies in understanding and appreciating what God intended it should be from the beginning. The Bible says God was refreshed on the Sabbath day. He “rested,” though God could not be tired. God spent that first Sabbath day with Adam and Eve, His two newly-created creatures; His son and His daughter. As God spent that day with them and God got to know them better, they also began to know Him, and it was such a beautiful experience for them all that the Bible describes it by saying that “God “rested” and was “refreshed.” (Exodus 31:17) No doubt it was a beautiful experience for Adam and Eve also. God “sanctified” the day. He set it apart forever, and in this He was saying, “I want this experience to come back over and over again. Every seventh day I want to enter into this experience again.” The Sabbath became a memorial of that “rest” experience which God had enjoyed. A memorial of that first seventh day when God and man had enjoyed total oneness. God is inviting man to continually enter this experience which He had with Adam and Eve on that first Sabbath day, and the sign of this relationship is the observance of the seventh-day Sabbath. Outside of this, the Sabbath loses its meaning. It is the experience which the day is intended to foster and to commemorate, which means something. Apart from this, the Sabbath can deteriorate into dry, empty legalism. But truly understood and truly appreciated as God intended that it should be, it is one of the most beautiful gifts which God has given to man. But, as stated before, Satan always tries to counterfeit whatever God establishes. This is especially true in the case of something like the Sabbath which God set aside as a particular sign to be an identifying mark between Himself and His people. Satan set himself to counterfeit this, to destroy in people’s minds the reverence for the Sabbath which God had ordained that it should have. Satan set out to destroy the Sabbath, and I am going to now give some history as to how Sunday observance, which is the opposite thing, came into existence. I am aware that some of you who read this booklet have a long tradition of Sunday observance. Your grandparents, your parents, you yourself, may have been born into a home where Sunday observance was the normal way of life. Please understand that I do not mean to attack you or to hurt you. My only purpose, by God’s grace, is to help us to see things in the true light of the Scriptures so that we may have the option of choosing to walk in the light of God as we see more clearly the way that He would have us to take. “To understand the meaning and the significance of Sunday as the first day of the week, it is necessary to consider the five contributions that have been made to its place in the calendar, and to its manner of observance. “3. The Roman observance of the day of the sun. “4. The early Christian dedication of the first day of the week as a memorial of the resurrection of Christ. So we see that according to Collier’s Encyclopedia, Sunday observance began when pagans started worshiping the sun in ancient times. Now let’s take a look at a little history. Perhaps it might not be very easy to check out the facts which we are about to examine. However, you will be able to find many of these facts in the books, Babylon, Mystery Religion, by Ralph Woodrow and The Two Babylons by Alexander Hislop. The Bible speaks in Genesis 10 and 11 of a man named Nimrod. You will remember that when God destroyed the world by a flood He commanded Noah to build an ark in which he and his family found refuge and escaped that terrible destruction because they trusted in, and believed, God. Some years after the flood this man Nimrod began to become a person of renown in the earth. The Bible says that he became “a mighty hunter before the Lord.” Or as some commentators have rendered it, “a mighty hunter instead of the Lord.” What we are made to understand is that Nimrod began to set himself up as a mighty person, as one who was to be looked up to instead of Jehovah. He was the first man on the earth who made war on his neighbors. Up to this time there had been no governments, no nations. People had lived in scattered family groups with the head of each family being the highest authority but with no central authority or organized social structure. Nimrod decided to gather people together into cities and to bind them together under one central government with himself as the ruler, the ultimate authority. The Bible says that the beginning of his kingdom was Babel. Nimrod made war on his neighbors, established a kingdom for himself and proceeded to set himself up as the greatest man on earth. Nimrod was such a powerful man, such a skillful warrior and so successful in the hunt and in warfare, that the people eventually elevated him to the place where they actually regarded him as a god. They began to look to him as their protector and provider. His wife, Semiramis, who was said to be a very beautiful woman, of course rose in the shadow of Nimrod to become the most powerful woman in the world. Nimrod was eventually killed (it is believed by Noah’s son Shem who remained alive for a period of five hundred years after the flood and who led an expedition against him because of his blasphemous acts against God), but Nimrod’s wife, Semiramis, managed to convince the people (in order to maintain her influence as queen) that Nimrod, in dying, had merely moved on to a different sphere and that his spirit was now in the sun, and that day by day as the sun passed by overhead Nimrod’s spirit was watching over them all. This was the beginning of Sun worship, with the corresponding Sunday observance. Eventually Semiramis died and they came to believe that her spirit was gone to live in the moon! So they also started to worship the moon and called it the queen of heaven. You may read in Jeremiah 7:18 where God rebuked the people of Israel for copying the heathen nations in worshiping this queen of heaven. They worshiped the sun, the moon, and eventually they even worshiped the planets and the stars. Since they regarded the sun as the most important god, they dedicated the first day of the week to the sun and called it the day of the sun. This is where the name “Sunday” came from. The second day was called Moon’s day in honor of the moon and the other days were dedicated to various other gods. So this is really where Sunday observance began. With heathen sun worship Satan’s counterfeit of what God had established. God had consecrated the seventh day of the week and set it aside for His honor and worship. Satan led men to substitute the opposite, the first day of the week. This deception has continued right down through the ages. Almost every heathen nation has had a history of sun worship, with the corresponding observance of Sunday. In Egypt they worshiped the sun under the name of Ra; in Babylon he was worshiped as Bel; in Medo-Persia he was worshiped as Mithra. The Romans also embraced this form of sun worship called Mithraism, while the Greeks adored him under the name of Apollos. Also, as you read the Bible, you will find that the Israelites had a great deal of conflict with heathen sun worshipers whom they encountered in Palestine and who worshiped the sun under the name of Baal. At one time, during the days of Elijah, sun worship filled Israel and there was eventually a great confrontation on Mount Carmel between Elijah and these worshipers of Baal. You may read about this in 1 Kings, chapter 18:20-40. Ezekiel had a vision in which God showed him a group of men who professed to be God’s people but who turned their backs to the temple of God and worshiped the sun toward the east. This story can be found in Ezekiel 8:16. This is the true story of how Sunday observance began, and the Bible states in a startling text which many people have never read (in Daniel 7:25) that the beast kingdom would “think to change times and laws.” Please make a note of this text and read it carefully! This is what God showed to Daniel in a vision. Think about this: Whose times would he change? Whose laws? There is nothing unusual about changing the laws or the times of men. That happens all the time. So when God warns us that the little horn on the head of the beast would try to change “times and laws,” it must be clear that He is talking about GOD’S TIMES AND GOD’S LAWS! Somewhere in God’s law, in the Ten Commandments, there is a law which deals with time and the Bible tells us here that the little horn, which is the Papacy, would try to change it. Now if we go through the Ten Commandments from beginning to end we will find that there is only one commandment which deals with time. All the commandments begin “Thou shalt” or “Thou shalt not,” but this one begins with the word “Remember.” The peculiar thing is that this is the one which people are most neglectful of and are most willing and anxious to forget. God says, “Remember the Sabbath day to keep it holy.” (Exodus 20:8) He says, “The seventh day is the Sabbath of the Lord thy God.” (Exodus 20:10) Friends, we have seen clearly that the beast represents the Roman Catholic church-kingdom. It is this beast- kingdom which has tried to change God’s times and laws. Let us now read from the writings of the Roman Catholic Church itself to prove to you that this church is the one which has tried to change the Sabbath from the seventh to the first day of the week. Roman Catholics are not ashamed of, or embarrassed by, this change. They boast about it! They claim that their church has the authority to change even the laws of God! They claim that the Pope has received this authority from God, and the statement has been made that it is a MARK of the power of the church that it has been able to change even the laws of God. Do you see the significance of this? The Roman Catholic Church says: I changed the Sabbath. God gave me that authority. Everybody else has accepted this change and now acknowledges Sunday as a day to be observed as holy. Therefore, this means that everyone accepts that God has given us, the Roman Church, this authority. So you see, Sunday observance is a MARK of our authority! Let me read to you from the Catholic Encyclopedia, Volume 4, page 153. For hundreds of years Christians all over the world have observed the first day of the week instead of God’s Sabbath. Many of them have done this in ignorance, sincerely believing that they were doing the correct thing. God has accepted their worship because they did not know better, and has counted them as His children because they were sincerely seeking to please Him even though in their lack of understanding they were disobeying Him. But God desires that we should worship Him not only in spirit, but also in TRUTH! (John 4:24) And as we come to the end of time, the truth and the glory of God must go to the ends of the world. It is impossible for a person’s life to glorify God in the way that God wants as long as he continues to hold on to error and falsehood. How can a man truly glorify God if there are elements of paganism in the way that he worships God? God speaks to us through His Word and He calls us up, higher to a more pure and perfect worship! And those who hear and yet refuse to obey the word of God place themselves in a position where they are in rebellion against God and are in danger of being eternally lost! Having read this, you have an obligation to obey God. You cannot, after this, claim that you are ignorant and that you do not understand. Your own conscience will ever after trouble you and give you no rest until you make up your mind to surrender completely to the will of God or else grieve away God’s Holy Spirit by continual disobedience and so end up with the devil and his angels in the lake of fire! Now what does all of this have to do with the mark of the beast? Have you seen the direction in which this study is heading? Some time ago, back in the year 1977, as a young Christian I was feeling a bit discouraged one day and I prayed to God and asked Him to show me a sign just to give me a little encouragement, to show me something to help me to be reassured that the end of time was indeed very near. Now that I am a more mature Christian I would not ask God for such a thing for I realize that the Word of God shows us very clearly where we are, and we are to base our faith upon that Word, rather than upon signs. Nevertheless, I was a baby in Christ and God understood this, and He will sometimes give something to a child that He would not give to an adult. Later that day, I saw God’s answer. An article appeared in the local newspaper, The Gleaner, which had the caption, “Methodists concerned over misuse of Lord’s day.” When I read the article it struck me with tremendous force. It stated that the Methodist Church in Jamaica was concerned about the “misuse” of the “Lord’s day” (meaning Sunday). They were concerned that there were too many sporting events being held on that day, too much recreation, and too little regard for the sanctity of the day. One particular statement caught my attention. They said that “Christian corporate worship,” or in other words, unity among Christians, could only be achieved if it was based on a greater regard for Sunday as a holy day. This is the direction in which Satan is leading the world. He wants it to be established by law that Sunday should be treated as a holy day! It is Satan’s plan! He means that the whole world shall embrace his form of worship rather than God’s! This has been his plan from the very beginning. Whatever God has ordained, Satan has tried to turn upside down. Unhappily, even those who call themselves the children of God, who go by the name of Christians, have allowed themselves to be deceived by the father of lies and have not only accepted pagan Sunday observance, but are demanding that the governments of the world should force every person, by law, to give the same honor to the false Sabbath that they have given to it. Jesus said that the way to eternal life was straight and narrow and that only a few people would find it. He stated that many would one day come with the claim that they had served Him faithfully and had done many miracles in His name, but His answer to them would be, “I never knew you!” (Matthew 7:13, 14, 21-23) This is exactly what is happening. People are claiming to be Christians, when in reality, they are serving Satan. Let us beware of blindly following the majority. Let us not simply walk in the footsteps of the crowd. Let us follow the teaching of God’s Word, no matter how unpopular it makes us or what the consequences may be. This is our only safety. Satan is trying to bring the world to the place where, by a decree of law all mankind will be compelled to disobey God, and to serve the great deceiver. Just as in the days of the Tower of Babel, men are trying to work out their own salvation; to establish a religious system of their own choice rather than what God requires. This is why God calls the religious systems of the day “Babylon the Great,” the religious prostitute which commits fornication with the kings of the earth. But God will not accept false worship, and as He destroyed that tower of ancient times, so He will again destroy this present-day attempt to defy His word. There are several organizations in the world today, most of them located in the United States of America, which are trying very hard to get Sunday officially set aside by law as a day of rest and worship! Among these are: The National Reform Association; The International Reform Association; The Lord’s Day Alliance of the United States; The New York Sabbath Committee; The Federal Council of The Churches of Christ in America, among others. To get an idea of the direction in which these people want to go, let us read a quotation from a representative of one of these groups. This quotation was taken from a publication entitled, Special Alert No. 29, edited by a man by the name of Howard B. Rand, and published in May 1982. Of course, when this man says, “the seventh day, following six days of labor,” he means that we should start the week from Monday so that the Seventh day will fall on Sunday. That is exactly what the Bible says will happen when the mark of the beast is enforced! Those who refuse to receive the mark of the beast will be unable to either buy or sell (Revelation 13:17). Can you see where we are heading? The religious powers will influence the governments of the world to pass laws which will compel everybody to treat Sunday as a holy day! This is the mark of the beast! The sign of apostasy will be the observance of Sunday! The observance of a man-made commandment in direct disobedience to the Word of God. Those who at that time continue to observe Sunday, instead of God’s Sabbath, will in this way receive the Mark of the Beast. They will plainly demonstrate that they obey the beast rather than God. And now it has happened at last. On the 7th of July, 1998, in the most significant move of his whole career, Pope John Paul II sent out a 104-page “apostolic letter” in which he insists on the need for Sunday legislation. The letter is entitled, Dies Domini, or, The Lord’s Day. While it is addressed to “the bishops, clergy and faithful of the Catholic Church,” we should not believe that these are the only persons who will be influenced by the letter. Not only is it a mandate to all Roman Catholics to personally observe Sunday in a more meaningful way, it is also a directive to them to do all in their power to ensure that the whole society conforms to the Pope’s concept of Sunday observance. The following is a quotation from the Pope’s letter. To put it bluntly and in more familiar terms, what the Pope is pushing for is the passing of SUNDAY LAWS! The man who has called for this Sunday legislation is the person who, above all others alive on planet earth, is considered the symbol of morality; the one whose voice is most authoritative on social issues. In this area, the Pope is not just a figurehead. When he speaks, people in high places listen. His voice and influence helped to topple the mighty Soviet Union and brought about concessions in the attitude of the United States of America toward Cuba. When he calls for Sunday laws, we can expect things to happen. Note carefully that the Pope is not just asking for a greater respect for Sunday on the part of Christians. He states that Sunday rest is “not merely a religious obligation,” but is “a human right, which should be protected by appropriate legislation.” Specifically, he wants laws to “protect” Sunday! He wants his convictions, his standards of morality, his respect for Sunday, to be imposed, not just on all Roman Catholics, but on all societies; upon all persons living on the face of planet earth. He wants to ensure that the whole society, all the world, shall be persuaded to respect Sunday rest; not voluntarily, but BY LAW. Sunday observance has always been one of the key pillars of Catholicism. The Roman Church has hailed it as a “mark of her authority.” In the past, she has endeavored to compel others to honor the day against their will, but in recent times she has had neither the influence nor the power to do so. Why is it that she has now, once again, openly and unapologetically undertaken to impose Sunday observance on the whole society? It is because she feels that the time is ripe. Pope John Paul II realizes that his time has come. Once again Rome is mistress of the world and is pulling the strings. So, immediately, the Pope turns to the subject which above all others is dear to his heart. The one practice which above all others supports Rome’s claim of supreme authority in the religious world: the practice of Sunday worship. Although the movement is pressing forward, unseen, unnoticed by the people of the world, this issue will soon be forced upon the consciousness of every man, woman and child who is alive upon the earth. The Bible says that those who choose God’s way rather than the way of the beast will eventually be placed under sentence of death (Revelation 13:15). Yet those who are true and faithful to God and keep His commandments at the risk of life itself, will be the ones who receive the seal of God. Do you see how dreadful the deception is which now holds the world in darkness? May the Father of mercy help us to choose the way of light and truth. Of course I am not suggesting that all of those who worship on the Sabbath today are necessarily better Christians than those who worship on Sunday. It is true that at present, many of those who go to church on the seventh-day Sabbath are just surface Christians, without a deep experience in the things of God. When the mark of the beast is enforced by law, hundreds of them will give up their faith. They will accept the mark of the beast when their lives are threatened because, although they went to church on Saturday, they never really knew the Lord of the Sabbath, Jesus Christ. Nevertheless, God wants all His children to keep the Sabbath holy. The fact that there are some hypocrites among Sabbath-keepers does not mean that the Sabbath is not ordained of God. Some may think that it is just a matter of one day versus another, but the issue is far greater than that. It is a matter of loyalty and obedience. The Bible tells us that we are the servants of the one whom we choose to obey (Romans 6:16). By choosing to observe the day commanded by the beast-power, the day ordained by Satan, we are really choosing to honor Satan above God. In reality, we are worshiping Satan rather than God! This is why Revelation 13:4 says that, “…they worshiped the dragon which gave power unto the beast, and they worshiped the beast…” Are our eyes upon God alone? Are we loyal to Him? These are the real questions that we must answer. Do we love Him above everything else, even our lives? Will we obey Him even when the mightiest powers of earth demand that we do otherwise, or are the world and its influence upon us greater than our love for God? Is the approval of our friends, the praise of men and our slot in society so important to us that we cannot act independently of the crowd? This is really the heart of the matter. Today there is still time to choose for God, still time to reject Satan’s way. Will you wait until the crisis breaks upon you? It may then be too late! We gain strength by degrees, a little at a time, by obedience at each step of the way. As the truth comes to us we must accept it no matter what sacrifice is required. Do not wait! When we put off God and tell Him to wait, our hearts become harder and it is more difficult for God’s Holy Spirit to help us. Let us face the facts now and immediately take our stand for God’s truth, today. Friends, the world respects and honors men. The world worships men. They idolize their political leaders, their religious leaders, their sports heroes. But in Revelation 14:6 an angel is seen flying in the midst of heaven and his message is “Fear GOD, and give glory to HIM, for the hour of His judgment is come.” Worship God alone. Only God. Do not allow man to encourage or to compel you to dishonor God. Search God’s Word. Find the Truth and obey the Truth… all the Truth no matter what it may cost you. That is the only way we can be saved from the mark of the Beast when it is enforced. May God help us to choose His way now, while there is still time to choose.